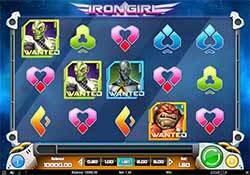 Join Iron Girl in her infamous Iron Armour to rid the universe of evil, in the new 20-line Iron Girl slot from Play'n GO. Battling against the universe's most nefarious criminals; Quake, Shia, Slith and Thunder, Iron Girl needs your help to triumph against evil. Collect wins by matching 3,4 or 5 symbols across the winning paylines, and capture villains and Wilds on your Reels, triggering re-spins and the possibility of multiplying your wins. Join Iron Girl in her infamous Iron Armour to rid the universe of evil, in the new 20-line Iron Girl slot from Play’n GO. Battling against the universe’s most nefarious criminals; Quake, Shia, Slith and Thunder, Iron Girl needs your help to triumph against evil. Collect wins by matching 3,4 or 5 symbols across the winning paylines, and capture villains and Wilds on your Reels, triggering re-spins and the possibility of multiplying your wins. So, what are you waiting for? Join Iron Girl in an intergalactic battle against the forces of evil for the fate of the universe! Iron Girl Wild Symbol – The slots’s star is the game’s wild symbol and can substitute for all other symbols in the game to complete wins. Iron Armour Feature – The Iron Armour can fly in at any time and add up to 5 random wilds onto the reels. The Iron Armour feature can lead to Villain Re-Spins. Villain Re-Spins – Highest winning villain combination is held in place for a re-spin along with any other matching villain or wild that isn’t part of a win. Re-spins continue as long as new matching villains and/or wilds are added to the reels. Bounty Bonus – When the re-spins conclude, a Villain reward will be triggered depending on the number of Sticky Villains collected. Get anywhere between 8 and 14 sticky villains to earn additional rewards like additional Iron Girl wilds or multipliers up to x5.